If you are looking to have the appearance of larger eyes, apply highlighter under your brow bone, above the crease in your eyelid. If you want your skin to glow, apply a small dot of highlighter in the center of the apple of your cheek after you apply blush. This will give your entire face an appealing shine. If you are trying to contour your nose, apply highlighter on the bridge of your nose. 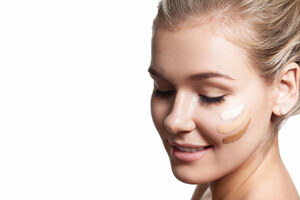 Then, using a foundation that is a little darker than your skin tone, gently blend it on the sides of your nose. This can give an appearance of a thinner nose. If you’d like to look more awake, try applying a dot of highlighter in the corner of your eyes. You can also try adding a tiny bit of highlighter to the center of your eyelid to make your eyes appear larger and it can also make you look less tired. If you want to add more definition to your cheekbones, try applying highlighter in a diagonal line from the center of your eye up towards your hairline. Be sure to blend thoroughly. Make your lipstick the center of the show by adding a little highlighter to your cupid’s bow, which is that area right above your top lip. If you want a better all-over glow, mix a little bit of liquid highlighter with your moisturizer, tinted moisturizer or liquid foundation. There are many different types of highlighters from sticks to liquid and colors that range from colorful and sparkly to subdued and natural. Experiment with different types and colors and on different parts of your face to determine what you love the most and what gives you your most desired glow. Do you ever use a highlighter? Where is your favorite place to wear highlighter? What are your favorite products? Let us know by sharing in the comments below!